The PCIC55 is a must-have accessory for using your smartphone and listening to music on your bicycle, motorcycle, jetski, ATV — any vehicle exposed to the elements. Just put your smartphone in the case, connect the headphone jack: you've instantly waterproofed your smartphone Best of all, you can still listen to music and control your phone while it's in the case. It's completely compatible with most touch-screen phones (excluding iPhone 5 and some Android phones - please check the dimensions of your phone against our specifications.) The internal headphone jack allows you to connect your headphones on the outside of the case without breaking the waterproof seal. 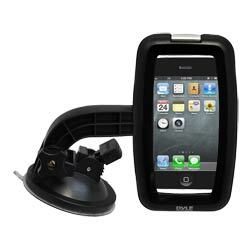 The PCIC55 comes with a versatile and adjustable suction cup mount so you can secure your device to your sport vehicle. This case is IPX-7 certified for submersion in water up to 3 feet. We, at the AIA Team, are looking for ways to make it easier for you to navigate our website, so please let us know of any feature that would help you. "; output = output + " "; output = output + "
Item Quantity added to cart.